The explosive growth of unstructured data puts new demands on network and storage infrastructure and challenges your ability to deliver services such as cloud computing. IT needs to respond rapidly to new and changing business demands, scale quickly and appropriately to fluctuating workloads, accommodate business expansions, and protect your data from cybercriminals—all while keeping costs down. The new Intel Xeon E5-2600 Sandy Bridge-EP processor product family is at the heart of an agile, efficient data center that meets your diverse needs. Now you can deploy a more secure private cloud, quickly crunch through big data, and get the most out of your data center with greater energy efficiency. Space and power consumption represent the two biggest concerns for data centers—both yours and those managed by your public cloud provider. 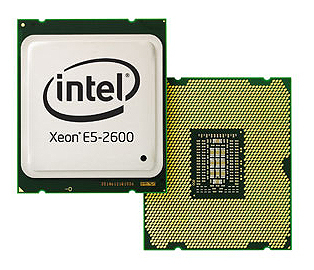 By combining Intel Xeon E5-2600 processor product family–based servers with other energy-efficient data technologies, you can increase data center efficiency, cut power bills and energy consumption, and reduce space needs. Selective processors in the Intel Xeon E5-2600 series also support Turbo Mode. Turbo Mode is an OS-controlled operation that automatically allows the processor to run faster than the marked frequency if the processor is operating below power, temperature, and current limits. The Dell PowerEdge T620 model will take up to two (2) processors. When adding a second processor to an existing server, the Intel sSpec number must match the first CPU.